When you introduce your little one to the world of puzzles you want to make sure that the jigsaws you choose are not only age appropriate, but also stunning enough to catch their eye and keep them interested. You’ll have no trouble on both those scores with the seriously gorgeous puzzles from Londji. Londji are focused on bringing back those often forgotten traditional toys and games, making them their own. 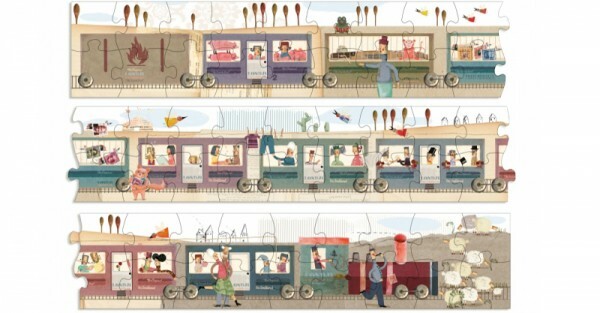 They combine enthusiasm, imagination and innovation into their designs to create original toys for kids, including a stunningly detailed and extremely artistic range of puzzles. Big pieces for little hands is the perfect way to introduce your child to the world of puzzles and Londji’s My Jungle Puzzle is just right for the occasion. The charming jungle theme features a roller-skating elephant alongside Mister Lion and his friends who have prepared a delicious picnic. 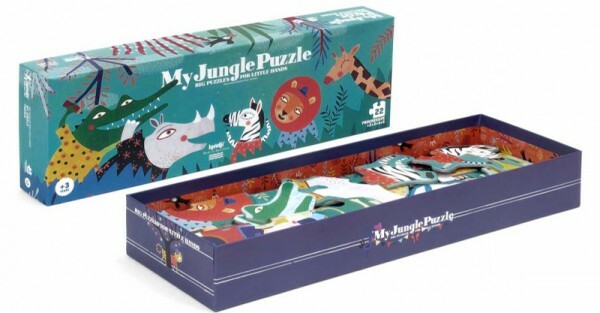 The My Jungle Puzzle is a progressive puzzle with animal silhouettes of two, three, four and five pieces that fit together in an imaginative scenery of eight larger pieces. Priced at $45 from Mighty Ape. When your toddler is ready to blast off and challenge their growing minds even more, then Londji’s Up to the Moon Puzzle is a tasteful choice. 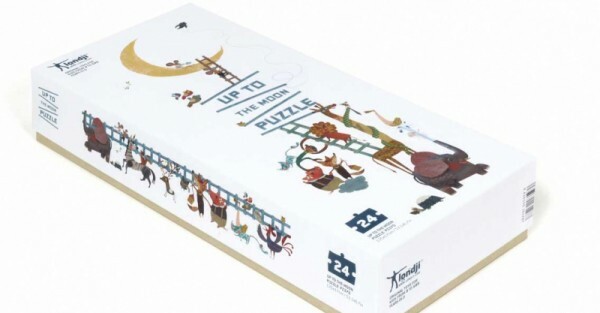 Piece together a planet where the moon is made of cheese and mice climb the animal tower to have a cup of tea, the puzzle contains 24 pieces and costs $60. I never quite understood the whole ‘kids with train obsessions’ business, until I had my own train-obsessed son. My daughter is into princesses and fairies, but I now see trains, lots and lots of trains in my very near future. While he is still a bit young for a puzzle as large as Londji’s My Longest Puzzle, I know he’d love it for the picture alone. The amazing cardboard puzzle contains 52 pieces and is a whopping, two metres long! It costs $45. My Pirate Puzzle is basically a two in one deal and my personal favourite. Your child can learn and discover the parts of the body with Captain Londji Red beard. 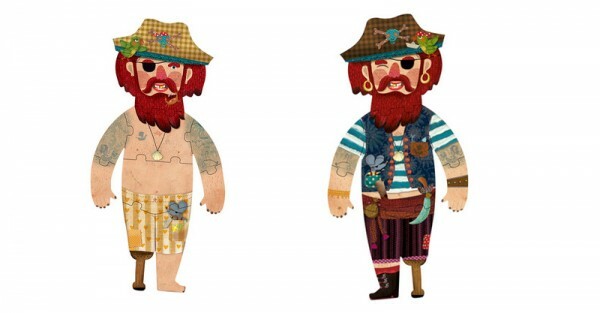 The puzzle consists of ten reversible pieces, on one side the pirate is dressed and ready for a treasure-hunting adventure and on the other he is ready for swimming with the sharks. Priced at $31. Puzzles are a fun way to increase your little one’s visual spacial awareness and help to develop their fine motor skills. Londji have a puzzle for everyone in the family, including mum and dad. You can order one of Londji’s stunning puzzles online through local stockists Mighty Ape and Shop Of Toys. You can also follow the Londji Facebook page for regular updates on their new puzzle releases for the coming months.